Androgenic (they make you more masculine). Anabolic steroids are primarily used in veterinary medicine. In humans, doctors prescribe steroids to treat people who are slow to reach puberty, people with some blood disorders, and those with some types of breast cancer. 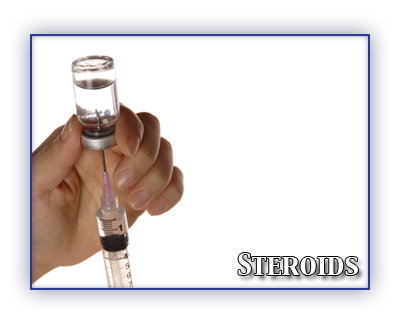 Anabolic steroids should not be confused with corticosteroids. These are prescribed for asthma and other disorders and do not build muscles. Although anabolic steroids are banned by most professional and amateur sports, many athletes use them to improve their performance in sports requiring strength and power. These sports include track and field, weight lifting and football. Some men also use steroids to improve their physical appearance. Users take steroids orally or by injection. Many athletes take doses 5 to 10 times larger than those prescribed medically. Body builders and weight lifters may take doses up to 100 times larger. Steroid users tend to follow a variety of dosing routines. These include cycling (periods of use followed by periods of abstinence), stacking (combining different steroids in different forms), and pyramiding (peaking then tapering doses). Although selling anabolic steroids for non-medical use is illegal, they are readily available in most gyms. Since most of these steroids come from the “black market,” they may be diluted with other substances. Some may be toxic. Steroids can increase your ability to exercise by reducing fatigue and increasing motivation. When combined with intensive training and a nutrition program, steroids can increase lean muscle mass and strength. Steroids also cause unpleasant side effects like acne, high blood pressure and increased cholesterol levels. Users can also have sexual problems. Large oral doses can cause stomach-ache, nausea and vomiting. People who inject steroids and share needles risk bacterial and viral infections, including hepatitis and HIV, the virus that causes AIDS. Teens using high doses may have their growth permanently stunted. If you take high doses for a long time, you risk rupturing tendons. You can develop blood clots, stroke, heart disease and heart attacks, liver disease and cancer. Many of these effects are irreversible. If you take high doses for a long time, you risk rupturing tendons. You can develop blood clots, stroke, heart disease and heart attacks, liver disease and cancer. Steroid users do not appear to develop tolerance. This means that larger doses are not needed over time to achieve the same effects. Dependence on steroids does occur. Users can experience both physical and psychological withdrawal symptoms when they stop taking steroids. These include nausea, headache, sweating dizziness, irritability, and depression.